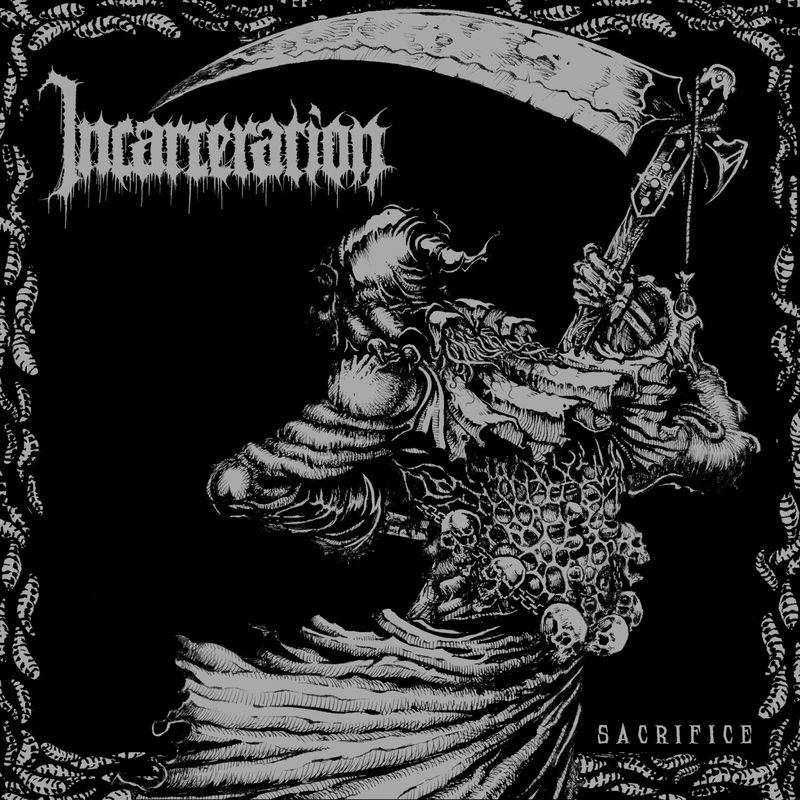 Incarceration started out in 2010 as a one man project from Daniel Duracell who originally wrote the entirety of the track "Sacrifice", which appeared on the project's first release in 2012; a split between Incarceration and Escarnium. Daniel moved his role within the band to guitarist/vocalist and enlisted the help of two other band mates, bassist Björn Freese and drummer Michael Koch, in 2013 and the now complete line-up proceeded to tour with Escarnium. The band ended up signing with F.D.A Rekotz and their debut EP, Sacrifice, has now been unleashed. Comprised of three tracks, two being new, what are listeners in for with this homage to old school death metal? An alluring fact about Sacrifice is that it was only released on vinyl and tape in limited qualities, and that alone gives it a truly underground quality before even listening to its contents. 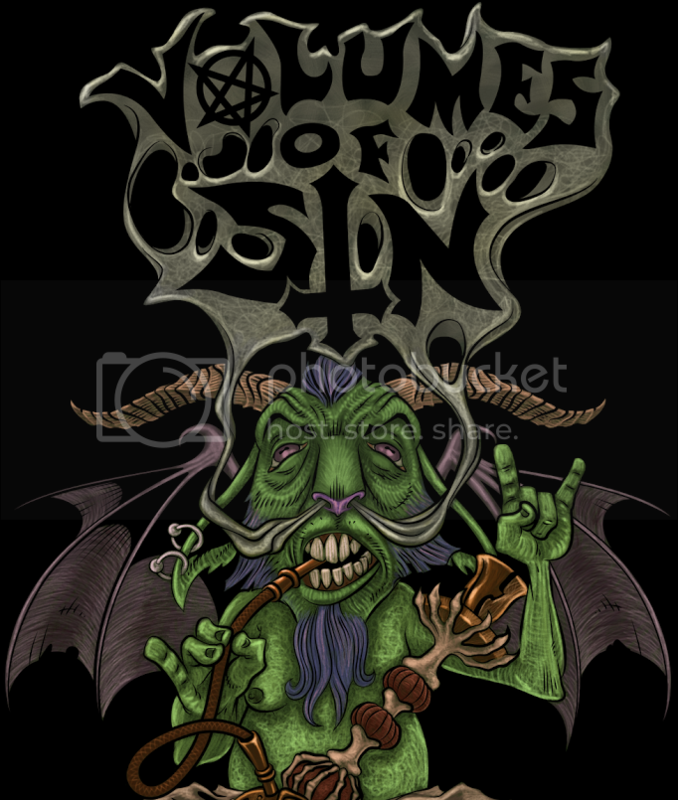 The artwork that is depicted is generally associated with black metal albums, and is fairly rare to see in the world of death metal; with its ink pen imagery, full black background and light grey glaze over the drawing itself. 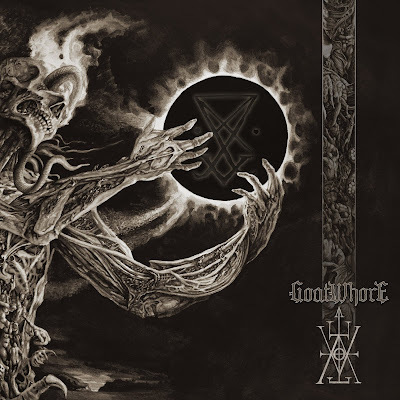 Even the artwork that lies inside and on the back layout is more brutal than the cover art, armed also with an upside down cross. On the vinyl version of the album, instead of the typical "side a/b" the sides are noted as "side sickfuck" and "side badass", which makes the experience all the more unique. What prevails under the exterior are a luscious flurry of rapid guitar riffs, pounding drum beats and vocals that are right fit for the material. 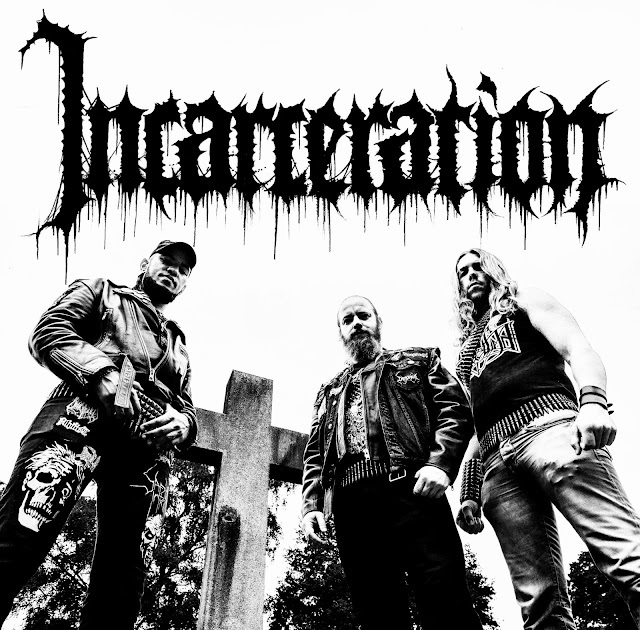 Each track is a high octane thrill ride that is writhing in hi-hat/snare combination blast beats that throw in fluid rolls and a few obscure patterns, all the while the guitar is taking the lead with ear melting power chord riffs that rival some compositions of early Slayer material; even the solos that make their all to brief appearances are filled with assaulting, appropriately placed tremolo picking and accelerated hammer ons/pull offs. There are also firm influences of Grave, Death, and Nihilist present, especially within the echo laden growl vocals that give the content a cavernous feel due to their reverberating nature. There is really only one affliction that strikes Sacrifice. The album is encased in a high treble atmosphere that doesn't just stick to the guitar, but rather pervades the entire instrument make-up, leading one to believe that the material may have had some post-recording work to incorporate this since it sounds like a filter. Typically, if the tracks had been recorded that way, the sound would stick to just the guitar; although it's hard to distinguish because the drums make use of a very high and light kit, which could give a certain disillusionment to the treble. That being said, the guitar would find itself driving the material even further with a deeper, more beefy tone or the bass could stand to be pushed up in the layering; rarely does the bass make too much of an audible arrival, being largely overlaid by the drums, which also does not help the treble soaked guitar. 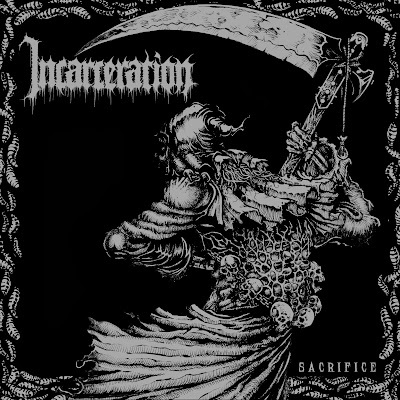 Incarceration are definitely on the right path of old school death metal with Sacrifice. The riffs are frenzied, the drums are tight, and the vocals are perfect for the subject matter. The content could use a more substantial guitar tone, but other than that this EP is one of the better resurrections of early style death metal. Highly recommended to fans of Slayer, Death, Grave and anyone else who enjoys a good death metal throwback that is slithering with high potential.